Here in the desert, we are just barely starting to get a hint of fall. While the daytime still frequently hits temperatures in the 90s, the nights have been cooling down to the 60s. The cooler nights allow us to shut the doors and windows all day, and keep the cool early-morning air in the house, thus avoiding the air conditioning. I know that in normal climates, it has been fall for quite some time already. And, with fall comes pumpkins. I have started doing pumpkin-themed activities with my first grade students, and decided to expand the pumpkin theme to my cooking. Last week Isa posted a recipe for a chocolate pumpkin loaf over at The Post Punk Kitchen. The pictures looked wonderfully delicious, but I don’t have a loaf pan in which to cook the chocolately, pumpkiny loaf of deliciousness. Luckily, she also added a note to the recipe giving cooking times for muffins. So muffins I made. In addition to the chocolate chips, I added some chopped up pecans to my batter (about 1/4 cup, I think). I totally plan on making these muffins again, and this time I might decrease the sugar a bit, decrease the chocolate chips a little bit, and increase the nuts to 1/2 cup. Chocolate pumpkin muffins, cooling in the muffin tin. I ate two of the muffins the day I made them, put three more in a tupperware in the refrigerator, and shared one with my roommate. The rest, I wrapped in plastic wrap and stuck in the freezer. I have been bringing them to work and eating them as a snack in the afternoon when the students are gone. These chocolate pumpkin muffins have regularly been the best part of my day, this week. And it hasn’t even been a particularly bad week. The muffins are just that good! Close-up of a chocolate pumpkin muffin, in all its chocolately, pumpkiny glory. I ended up having some pumpkin left over after I made the chocolate pumpkin muffins. I was nearly out of granola, so I decided to make pumpkin granola with the leftover pumpkin mush. I originally was planning on using my normal recipe, and just adding the pumpkin in place of the apple sauce (which I use as a substitute for oil). 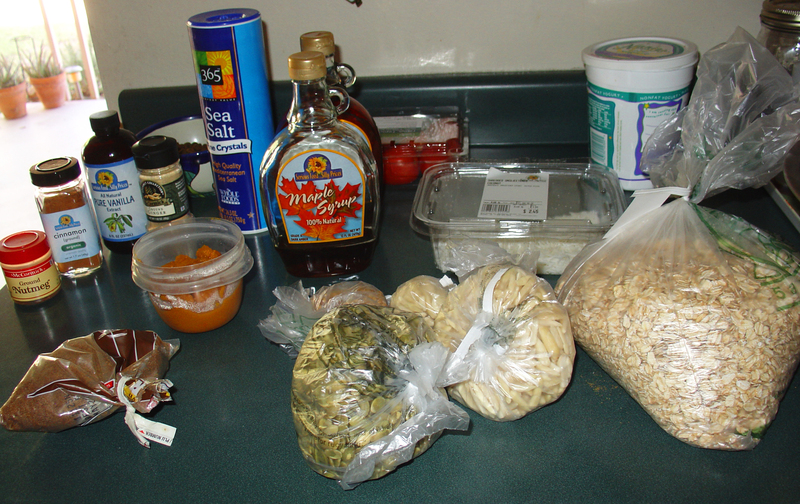 But then I decided to look around on the internet for a recipe specifically for pumpkin granola. I decided I should use a different recipe, since the pumpkin granola recipes call for different spices than regular granola. I settled on this recipe from The Pastry Affair, partially because I had all the ingredients, partially because the website had such pretty pictures, and partially because it just sounded really good! I love the bulk bins and the spice aisle. I ended up sort of badly burning one pan of granola (I had it on the bottom oven shelf, and it was too close to the heat source). Then, after I took out the burnt pan and was continuing to cook the other pan, I burned that one, too. (What can I say, I’ve got skills.) When I took it out, it was smoking, for more than a few minutes. However – I am stubborn. I was determined that it would taste great even if it was a little scorched. I picked out the worst burned parts, and tossed the others together. Ultimately, it is a tad well-done, perhaps a little crunchier than even granola is supposed to be, but it still tastes good. I don’t know that it actually tastes pumpkiny at all, but it does taste like granola, which was really my main goal. 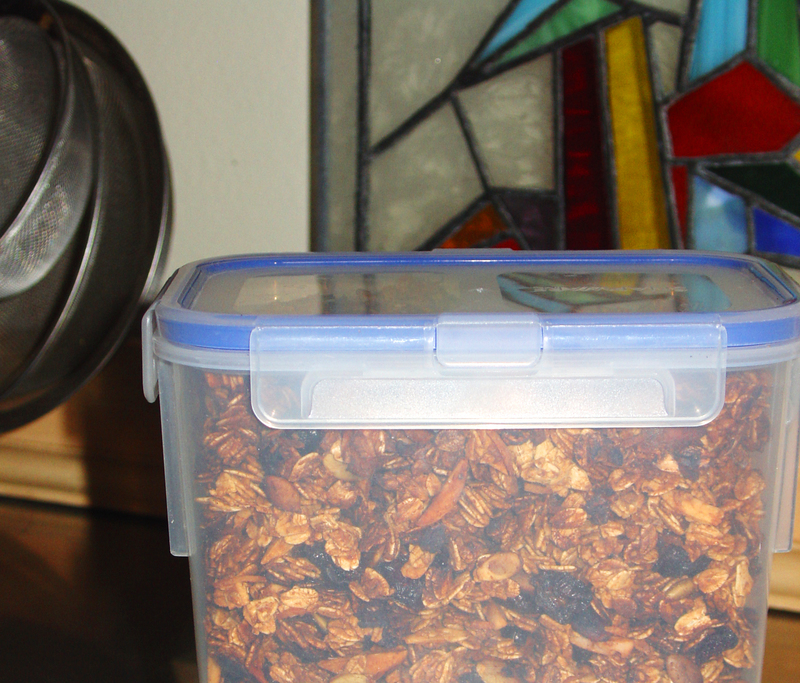 Pumpkin granola in my perfectly-sized granola tupperware container. I was reading a book about pumpkins with my students the other day, and it talked about how the Native Americans used to eat pumpkin seeds for breakfast. They were all confused and awestruck. I told them that I had eaten granola with pumpkin and pumpkins seeds in it for breakfast, and they were fascinated. I’m not sure what my next pumpkin adventure will be. I do not like cutting pumpkins or other squash. It is hard work! However, it is also delicious. In fact, I am doing a pumpkin seed activity with my students and may end up cutting open two dozen pumpkins tomorrow… Maybe I’ll get really, REALLY good at it.